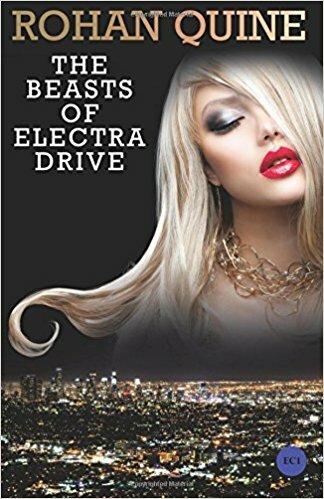 Aptly titled, The Beasts of Electra Drive tells the story of a video game designer’s revenge on the “Dreary Ones,” the corporate leaders at Bang Dead Games, the company where he worked until recently. They’re about to release a new, glamorous social media software, Ain’t They Freaky!, designed to fuel the tabloid-style view of the world—cutting others down to build oneself up—and Jaymi Peek feels that something is wrong. Despite owning an opulent house on Electra Drive and two nearby rental properties, something is missing…and then he has an epiphany. He realizes that the corporate vision is harnessing his talents to make brutal and infantile diversions, and he decides he wants to take another path. He longs to use his creativity to produce truth and beauty, to expand the world’s vision rather than to narrow it, so he quits his job and begins to make his own games. In the process, he discovers that he can bring his incarnations of excessive freedom, sexuality, intellectual seriousness, cool ambiguity, and dark vulnerability to life, unleashing them on “meat space.” They become his beasts, extensions of his own personality, and through them, he interacts with the executives behind Ain’t They Freaky! As various elements of Bang Dead’s software are released, Jaymi works to help his former coworkers recognize the shallow depravity of their game through unnerving visits to their homes. Sometimes, Jaymi’s goal seems to be retribution rather than persuasion, especially when his beasts leave increasingly gory and gruesome messages behind. The story can come off as too self-aware, with chapters bearing labels like “First Doorway of No Return” or “Second Pinch Point.” The narration feels like poetry at times, with the cadence and repetition of concepts that such artistic styling brings, but there are places where it feels like a cut-and-paste job, with only minimal tweaking and no new emotional significance to the paragraphs of repetition. And Jaymi’s vision of truth and beauty can feel a touch exclusive. All his beasts are familiar with night clubs, with drinking and partying and varying degrees of self-absorption, and it seems like Jaymi’s expression of who or what should “rule the world” involves excluding the conventional or conservative, targeting them as “dreary” without examining the complexity of their side of things. There are times when the world building is too fluid, even for magic realism. The world of the story can be blurred at times thanks to the nature of the beasts, as they can visit humans in Los Angeles or go into code and the world of servers with equal ease, but there are moments when these lines blur, where an attack in “meat space” resembles the surrealism of code without any explanation of how or why such a thing occurred. This is a powerful book that advocates letting people be themselves, despite how far outside the bell curve of “normal” they are. Pulsing with sexuality, the story will appeal to readers who enjoy artistic works rich in vocabulary, symbolism, and graphic imagery.